Author: Michael E. Fassbender, Ph.D.
Summary: Learn about famous King Nebuchadnezzar. King Nebuchadnezzar II (or Nebuchadrezzar II, 630–561 BC) is probably the most famous Bible character of Gentile origin. He reigned from 605–561 BC and was the second and greatest king of the Chaldean dynasty of Babylonia. He was known for his military might, the splendor of his capital, Babylon, and his important part in Jewish history.i The Bible is one of the only sources on the personality of this mighty and influential ruler. Nebuchadnezzar, the "Destroyer of Nations"
Now Nebuchadrezzar king of Babylon gave charge concerning Jeremiah to Nebuzaradan the captain of the guard, saying, Take him, and look well to him, and do him no harm; but do unto him even as he shall say unto thee. That thou shalt take up this proverb against the king of Babylon, and say, How hath the oppressor ceased! the golden city ceased! … How art thou fallen from heaven, O Lucifer, son of the morning! how art thou cut down to the ground, which didst weaken the nations! According to other sources,iv Nebuchadnezzar had the Hanging Gardens built around 600 BC for his wife, Amytis. Allegedly, Amyitis was homesick for her mountainous home, and rather depressed living in flat and arid Babylon. An elaborate garden was therefore constructed to replicate her lush homeland and cheer her up. Nebuchadnezzar's policy was to control the population via terror. He appointed new governors who were loyal to him. The population did not have to be moved. It only had to be beaten into submission.iii Despite his cruelty, Nebuchadnezzar was considered a genius of the gentile world; not only was he the monarch of the greatest nation of that time, but he was also eminently wise and had an innate sense of justice and right.v We now understand that this monarch displays a type of dual nature: He was the author of the prototype engine of conscience control and persecution. But, he was also an attentive listener to God's prophet Daniel. Nebuchadnezzar was a proud ruler with some good character traits. Perhaps God looked at Nebuchadnezzar's innate sense of justice. You remember that Solomon was also commended for his "understanding to discern judgment" (1 Kings 3:11). But the Lord of Hosts had to break Nebuchadnezzar's pride first. So, God started communicating with Nebuchadnezzar and sent him a message. He revealed to him all earthly superpowers and the coming of His ultimate Kingdom. But the message was "encrypted" and it required the prophet Daniel to "decrypt" this message to the king. All knowledge, sacred and profane, came to be monopolized by the priesthood, who dealt it out to those who were initiated in the "Mysteries" exactly as they saw fit according as the interests of the grand system of spiritual despotism…The priests were the only depositaries of religious knowledge…and without blind and implicit submission to them, what was necessary for salvation could not be known…In that system, secret confession to the priest, according to a prescribed form, was required of all who were admitted to the "Mysteries"…Their silence in regard to everything they were commanded to keep secret was secured both by the fear of the penalties threatened to a perjured revelation, and by the general CONFESSION exacted of the aspirants after initiation— a confession which caused them greater dread of the indiscretion of the priest, than gave him reason to dread their indiscretion. According to Hislop, to drink "mysterious beverages" was mandatory to all who sought initiation in these Mysteries.vi These "mysterious beverages" consisted of "wine, honey, water, and flour," and they were of an intoxicating nature. In the Babylonian system of religion, knowledge was only revealed to the "initiated," who drank from the "golden cup." Remember Belshazzar's feast in Daniel 5, where the elite drank from the vessels brought from the temple. Furthermore, the Chaldeans entertained a wide-spread spy network operating in secrecy, where the "initiated" had to give up their privacy to the superiors under threat of penalty and were thus kept in check. 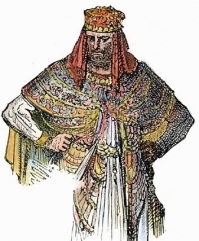 Chaldean priests were advisors (Daniel 2:2), maybe even "father-confessors" (verse 4) to king Nebuchadnezzar, to whom he usually would confide his dreams. From this perspective, you now understand Daniel much better when he says "He revealeth the deep and secret things: he knoweth what is in the darkness, and the light dwelleth with him" (Daniel 2:22). This is a strong reference to the Babylonian mysteries, since Daniel was versed in the "learning" of the Chaldeans (Daniel 1:4). In the "meeting" between God, the king, and God's messenger Daniel, the system of secrecy and darkness is exposed by the system of revelation and light. When Daniel went ahead and identified the king with the head of gold, Nebuchadnezzar was certainly pleased. He was, however, not too excited about verse 39. It is important to note at this point that God revealed the remaining political history impacting God's people to a Gentile king. Not to king David were world politics revealed, but to this arrogant and cruel builder of the neo-Babylonian empire. The king's submission to Daniel (see Daniel 2:46–47) indicates that his pride had gotten its first blow. Nebuchadnezzar had to face the fact that his all-knowing Chaldean system of darkness and secrecy was inferior to God's government. But was he really converted yet? Not so. He was actually filled with fear that someone was trying to overthrow his kingdom. In today's jargon, he was deeply worried about the national security of Babylonia. The king resorted to a number of totalitarian instruments to sustain the security of his government, much like Hitler, Mussolini, Stalin, and other dictators would do later. He knew first-hand from divine revelation that his government would eventually be replaced by something else. Yet he thought he could defy God's prophecy. In an aggressive campaign, the king sought to manipulate people into believing the lie that his kingdom would last forever. He invested money and resources in erecting an all-golden image (Daniel 3:1), and he instilled blind government obedience via propaganda and indoctrination. Note how his subordinates saluted the king (see Daniel 2:4; 3:9; 5:10), as opposed to the Hebrew boys, who never greeted the king this way. Similarly, Adolf Hitler had a dedicated department for the purpose of propaganda and indoctrination, and the brilliant speaker Joseph Goebbels was his Minister of Propaganda. In his "total war" speech he succeeded to rouse the Germans to the fanatical idea that they could easily win the war. Goebbels defied the uncomfortable truth that the tide of World War II was already turning against Germany.vii In the Book of Revelation, forces of propaganda and indoctrination are depicted as "frogs" since they catch their prey with the tongues (Revelation 16:13). Remember that Nebuchadnezzar's golden image did not stand for the country. Its purpose was to represent the government—" Thou art this head of gold"—and there is a difference. Nebuchadnezzar now feared a coup d'état, and he designed a test to find out who was loyal to his government and who was not on his side (Daniel 3:5). We know that Daniel's friends did not participate in this "pledge of allegiance" (Daniel 3:12). And here we learn about another instrument of totalitarian terror. It is one that has been utilized by Hitler's Nazi Germany and Communism alike: spying on a government's own citizens. Erich Mielke's Staatssicherheit (state security) of the former German Democratic Republic was probably the most sophisticated modern version of this kind of surveillance terror. The Chaldean initiated priests were not only advisors of the king; they also utilized their intelligence network to pinpoint and accuse opponents (Daniel 3:8). Individuals who did not follow the "flutes and harps" in Kadavergerhorsam ("obedience of the corpse"), as Heinrich Himmler, the head of the Schutzstaffel (SS), called this reflex-like submission to government forces, were reported to the king. He most likely suspected involvement of Hebrew "dissidents" in a coup. The next totalitarian tool in Nebuchadnezzar's national security state is obvious from Daniel 3:20: physical terror of the elite police force and cruel punishment of regime dissidents. How did that heathen king know what the Son of God was like? The Hebrew captives filling positions of trust in Babylon had in life and character represented before him the truth. When asked for a reason of their faith, they had given it without hesitation. Plainly and simply they had presented the principles of righteousness, thus teaching those around them of the God whom they worshiped. They had told of Christ, the Redeemer to come; and in the form of the fourth in the midst of the fire the king recognized the Son of God (Patriarchs and Prophets, 509). Obviously, Nebuchadnezzar was impressed and praised God again. But was he converted yet? Unfortunately, he was still an oppressive and selfish ruler. Still a pagan in his heart, he now tried to enforce external respect for the Hebrew religion with state power, a type for end-time events (Revelation 13:14). More precisely, he enforced censorship, and he limited freedom of speech (Daniel 3:29), which is yet another totalitarian tool. In order to efficiently implement censorship, the terror of the allknowing Chaldean intelligence network of informants still had to be firmly in place. Next, the God of Heaven sent the third and final blow to Nebuchadnezzar's arrogance—his madness. In Daniel 4, the pen of inspiration recorded Nebuchadnezzar's final testimony. Daniel 4 is worth a closer examination. If you read Daniel 4:1–3 (KJV) and compare the king's statement to Psalm 145:12–13, you will find astonishing parallels. The phrase "mighty wonders" corresponds to "mighty acts." Both authors, kings David and Nebuchadnezzar, praise God's "everlasting kingdom" and "dominion" from generation to generation. It appears that both monarchs were driven by the same Spirit. Could it be that Nebuchadnezzar was familiar with the Psalms of David? The LORD shall cut off all flattering lips, and the tongue that speaketh proud things: …The words of the LORD are pure words: as silver tried in a furnace of earth, purified seven times. Wherefore, O king, let my counsel be acceptable unto thee, and break off thy sins by righteousness, and thine iniquities by shewing mercy to the poor; if it may be a lengthening of thy tranquility (emphasis added). …he doeth according to his will in the army of heaven, and among inhabitants of the earth. The once proud monarch had become a humble child of God; the tyrannical, overbearing ruler, a wise and compassionate king. He who had defied and blasphemed the God of heaven, now acknowledged the power of the Most High and earnestly sought to promote the fear of Jehovah and the happiness of his subjects. Thus, the king of Babylon had come "out of Babylon" (Revelation 18:4). The story of Daniel and Nebuchadnezzar bears the typology of the final religious conflict immediately prior to the Second Coming of Jesus Christ. The Book of Revelation mentions the antitypical Babylon that is active in the last days. This endtime financial, religious, and military superpower is portrayed as a geopolitical system working against God's people and against the truth of salvation. Knowledge, be it of journalistic, scientific or religious nature, will again be monopolized, censored and distributed by a centralized system of "one mind" (Revelation 17:13). In this mind-controlled new world order, basic rights like diversity, privacy, liberty of conscience and religion, will slowly disappear. Freedom becomes insignificant. End-time Babylon consists of three parts (Revelation 16:19). Out of this context, we can deduce that these three parts, or three governing entities, are the Dragon, the Beast, and the image of the Beast, or the False Prophet (Revelation 13; 16:13). The Spirit of Prophecy in Great Controversy, 443, identifies these three entities as spiritualism, the Papacy of Rome, and apostate Protestantism. Hence, "fornication" in Revelation 18 could be interpreted as an alliance of the political and spiritual with the super-rich elite, all being under the control of the spider web of secret societies. This secrecy web, in turn, is run by the antitypical counterparts of the "Chaldean initiated advisors" and "fatherconfessors," by the leadership priesthood of the sea beast power (Revelation 13:1–2). The super-rich elite, which have been accumulating tremendous wealth by skillfully extracting funds out of the global conglomerate of financial markets, does have the power to manipulate nations and people into financial dependency. They are indeed the "great men of the earth" (Revelation 18:23). Individuals and families are ruined when they become entangled in the snare of debt. Whereas it was always God's plan to finally relieve indebted families (Deuteronomy 15:1-6), Babylon will never set anyone free who is paralyzed by debilitating debt. It even ensnares young adults in credit card debt they will never be able to pay off for the rest of their lives.ix This is the cruel, dragon-like character of the financial system of modern Babylon. Moreover, the "kings of this world," a world powered by money and markets, install centralized, all-knowing tax collection agencies with virtually unlimited authority. Levying exaggerated penalties for trifle tax offenses is a tool of terror to destroy dissidents. Jesus explains that it is our duty to pay taxes (Matthew 22:21). All-powerful tax agencies under complicated laws may, however, misapply their authority to make "a dunghill" out of the "houses" (Daniel 3:29) of small businesses and families who dare to speak against the system. In present- time language, those who will speak against the "image of the Beast" may be subject to intimidation, raid, and seizure. Financial dependency will finally go so far that people will be willing to take upon them the "mark of the Beast" just to maintain market share and buying power (Revelation 13:17). The Spirit of Prophecy clearly interprets the mark of the Beast as Sunday worship (7 Bible Commentary, 976). Will Adventists forgo observance of the seventh-day Sabbath for the sake of securing some buying power and market share "for one hour" (Revelation 17:12)? Similar to Nebuchadnezzar (the king of typical Babylon), the rulers of antitypical Babylon will destroy sovereign nations and "beat" them into submission in order to install a worldwide, oppressive police state of totalitarian nature under the control of the "man of sin" (2 Thessalonians 2:3). This "son of perdition" will be the head of the final eighth beast power controlling the ten kingdoms (Revelation 17:10–11). But prophecy is not there to scare us; the purpose of God's prophetic message is to encourage you and me, to give us the assurance that no matter how powerful any political system will be, God will ultimately come to the rescue. Daniel's announcement, "He revealeth the deep and secret things," echoes down to our age. And the Lord Jesus confirms that no secret abides (Luke 12:2). His brightness shall destroy the depression, humiliation, and sin of Babylon. Christ Himself will come to consume the man of sin "with the spirit of his mouth" and shall destroy him "with the brightness of his coming" (2 Thessalonians 2:8). He shall deliver His people (Daniel 2:44). As seen earlier, Ellen White states that Daniel, Hananiah, Mishael, and Azariah lived the truth and the character of God as a testimony to the Babylonian king. Nebuchadnezzar was then able to recognize the Son of God as the fourth Man in the fiery furnace. You may be well familiar with the "big picture" typology in Daniel's story, where God shows us the ultimate delivery of His Church from the oppression of a satanic geopolitical power. However, there is also a very personal typology in the story of Daniel, his friends, and the mighty Gentile ruler. In this typology on a personal level, individual members of the remnant Church who "keep the commandments of God and have the testimony of Jesus Christ," who "fill positions of trust," give a powerful testimony to a high ranking official of the system of end-time Babylon. The amazing result is that this high-ranking official, may it be an elite politician, a military general or even the head of a government, will be called "out of Babylon the great" to become a humble child of God. The Bible says in Matthew 10:18, "And ye shall be brought before governors and kings for my sake, for a testimony against them and the Gentiles." What powerful testimony is there? The character of God is equal to the glory of God (see Exodus 33:18.19). Giving "glory to God" is thus equal to longing for a Christ-like character. This was the source of power in the case of Daniel and his friends. It is the message of the Three Angels as given in Revelation 14:6–12: not just preached, but lived. This final message to the world, as a truth represented before them "in life and character" and practiced as a living testimony of "what the Son of God is like," will be the light and brightness that will shine into the darkness of fallen Babylon. And the greatest privilege of all is evident from the typology of the fourth Man in the furnace—that Jesus Christ Himself, or a representative of His highest ranking angelic forces (Daniel 9:21), will come to the rescue of you and me to deliver us from the terror of Babylon as a testimony against "the governors and kings" and the Gentiles. I encourage you today to proudly identify yourself with the Hebrew boys in the king's court who steadfastly pledged allegiance to the God of Heaven. May the peace and tranquility of God be with you! v. Review and Herald (ed. ), Commentary on Daniel and Revelation (Review and Herald Publishing Association, 2009): 751.
vi. Alexander Hislop, The Two Babylons: Or, the Papal Worship Proved to be the Worship of Nimrod and His Wife (Edinburg: James Wood, 1862): 9-13.